Beyond the bright red second new bridge, the basin is filled with yachts, their masts rising in front of Ivory House, from 1860. It's the only surviving waterside warehouse around this basin and was converted to flats in 1971. 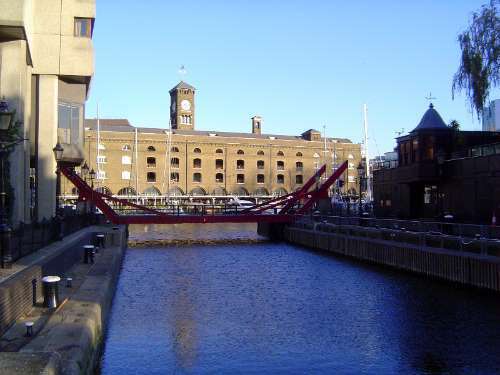 It may have been empty for a long time before then, because as early as 1850 ships began using the larger docks farther downstream, especially the so-called Royal Docks. No problem: the London Docks Company, which owned St. Katharine's and all the others on this stroll, owned the Royal Docks, too, until the London Port Authority took over in 1909. The building on the left is the "hideous" Tower Thistle Hotel (5:498). Blast that critic!